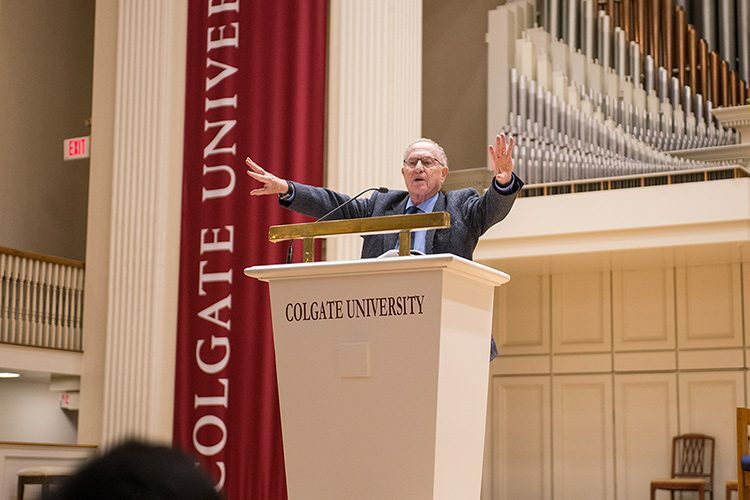 As Alan Dershowitz took to the Memorial Chapel stage in early November for his lecture, “Civil Liberties in the Age of Trump,” approximately 20 students stood and turned their backs in protest. It was a moment of First Amendment exercise that the target, a controversial scholar of constitutional law and advocate of civil liberties, supported. Dershowitz then launched into a vigorous defense against a 2014 sexual assault claim against him that has since been stricken from court records. After approximately 13 minutes, student protesters filed out of the chapel. Dershowitz thanked the students for their peaceful display and invited everyone to stay for the Q&A session so he could address any concerns. “I hope that we will be able to continue this conversation in a constructive way,” he said. Dershowitz discussed topics ranging from civil rights to the current public rhetoric on difficult issues. A self-described centrist liberal, he blasted President Donald Trump for separating immigrant families at the border, and he criticized journalists on both sides of the political divide for reporting the same facts differently based on their audiences. “Some of the media have prioritized ideology over truth,” he said. 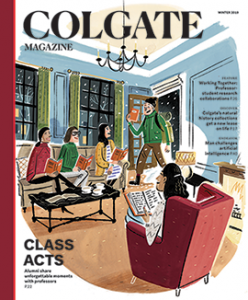 Sponsored by Colgate’s Center for Freedom and Western Civilization (CFWC), the lecture is part of a year-long series designed to encourage discourse. “The freedoms we have on this campus are blessings we should not take for granted,” said Associate Professor Carolyn Guile, co-director of the CFWC.